Started by cutting the longerons to length from AA6X3/4X3/4 Angle and marked the center line on each. All of these longerons need to be bent to a curve that runs along the fuselage from front to back. Vans supplies a template to match the bend to. To do this you place the longeron in a vice and firmly strike with a rubber mallet. You repeat this process at on inch intervals that produces the curve. This take quite a bit of time and patients as you must make sure that you do not over bend the longeron. In addition to this, while bending it is also possible to get a vertical bend while you are making the horizontal bend. You need to be careful not to do this and check often to make sure that it is not happening. I did get some of this vertical bending but not bad and was easily taken out. Once bent to match the template, the holes in the longeron are match drilled at this time using the template as a guide. You now fabricate a clamping block and Roll Construction Angles. These are just tools that will be used to make the bend in bottom forward and rear portions in the side skins that make the curve to the bottom of the fuselage. Not a hard process as it looks, just take your time and check your work often. I bent both side skins front and back. Amazingly they fit almost perfect the very first try. For the back curve, I did used a brake to make a slight bend in the edge where the side skin will transition to the bottom fuselage skin. This made a nice tight transition. Located all the pieces for the rear seat back braces, clecoed them and match drilled as called out in the instructions. Then clecoed them to the forward fuselage structure. Cute the baggage door shims and clecoed to the left side skin. Final drilled all holes except for the last portion that are not done at this time. Also did this for the baggage floor angles. Clecoed the mid side skins to the forward fuselage and checked the distances of the longerons. Before clecoing the lower fuse channels in, you need to make a twist in them. This requires clamping a spacer block into the ends, clamp one into a vise and using a cresent wrench on the other end, twist the channel a complete 180 degrees which will put about a 20 degree twist in the channel. 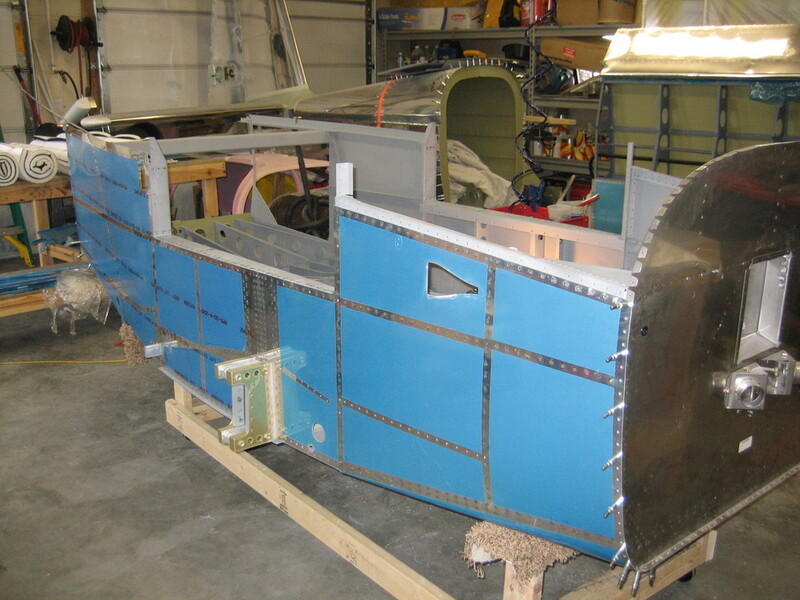 Once done cleco to the fuselage. I already had the bend in forward skins so I just clecoed them to the forward fuselage. Installed the rest of the side channels and final drilled all the holes in the side skins to the forward fuselage structure. Afer all channels and braces are attached and match drilled. I disassembled all the parts to prep them for priming. You got the process, deburr dimple, scotchbrite, clean with MEK, Alodine and then prime with an etch primer. Let everything sit for a couple of days to let the primer cure and started the final assembly for this section. There are a lot of rivets that need to be installed and it seemed that it took forever to get all of them in. There are some that need a special bucking bar or some modifications to ones that I had. After much time and some major frustrations, I got them all bucked. The last portion of this section is to install the rear vents. I am not doing this at this time because I am not sure I am putting them in or not. The vents look a bit cheap and going to look for other options. I will be installing vents in the ceiling so maybe these will not be needed at all. For now this section is considered complete. Lets move on. Fabricated two stiffener angles and clamped them into place on the center section bulkhead so that they can be match drilled. I then clecoed the mid seat rail supports together, match drilled all the common holes and then final drilled #40 all nutplate rivet holes and then match drilled all the #12 holes for the AN3 bolts that attach them to the center section bulkhead. Next the directions ask to cutout a portion of the center section bulkhead per the instructions. This was not required as the part I received already had them done by the factory. I then moved on to attaching the main gear and final drilling all the #12 holes. Also used the F-drill bushing to drill the #30 holes in the gear brackets, the then without the bushing final drilled these holes to #12. Temporarily bolted the gear mounts to make sure that the AN3 bolts will pass through all the parts with no issues. I then countersunk the the two holes on the center section bulkhead. Then I disassembled all the parts, duburred, countersunk and primed all the parts. Moving on to Section 25-4, I riveted the mid seat rail assemblies together and all the nutplates. Clecoed and then bolted the mid seat rail assemblies to the center section bulkhead and riveted together. The left and right center section bulkheads were now riveted to the center section spar. Installed all the snap bushings and torqued all the bolts to specs. It is not time to do the aft center section bulkhead assembly. Basically the same procedure as the center section bulkhead so not much to say on this part. Clecoed all the parts together, match and final drilled, disassembled, deburred, prepped and primed all the parts. Once dry I riveted them together and attached them to the center section bulkhead. The only thing added to this center section is it requires you to cut apart the two hat stiffeners and remove a portion of the bottom for access to buck the rivets on the lower flange. Did this and then riveted to the center section. Section 25-6, Riveted the nutplates to F-1004b and d center section bulkheads. Bolted the aft seat rail supports. Inserted all the snap bushings per instructions. I then fabricated the wear strip out of UHMW plastic, drilled the attach holes riveted in place. Next step was to final drill #40 all the nutplate attach holes and #19 all the nutplate screw holes in the rear spar bulkhead, side channel and idler arm brackets. Clecoed the rear spar attach bars, side channels, crotch strap lugs, gussets and idler arm brackets to the rear spar bulkhead and final drill #30 all the common holes between the parts. Remember to mark or tape over the holes that are to be left open. Disassembled all the parts, deburred, countersunk, prepped and primed all the parts. Once they were dry I riveted the nutplates all but the ones that go on the upper flange of the rear spar bulkhead. Riveted the rear spar attach bars, crotch strap lugs and idler arm brackets to the rear spar bulkhead along with the gusset to the bulkhead side channel. Then installed all the snap bushings. Last part of this section is to cut apart the F-1034D gussets, cleco these gussets to hold together fuselage bulkheads. Final drilled all the #30holes common to the parts. Final drilled the nutplate attach holes and the nutplate screw holes.. Disassembled all the parts, deburred, prepped and primed all parts before riveting. Riveted the gussets to the bulkheads and installed all snap bushings.